Welcome to the Articles page. Please enjoy articles written about some of my activities, books, and presentations. 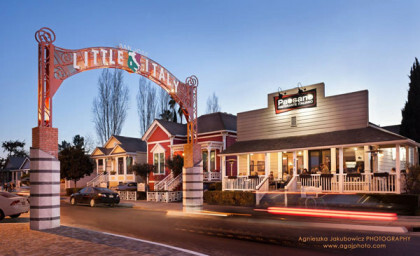 Article written by Bianca Friundi on the Italo-Americano paper. 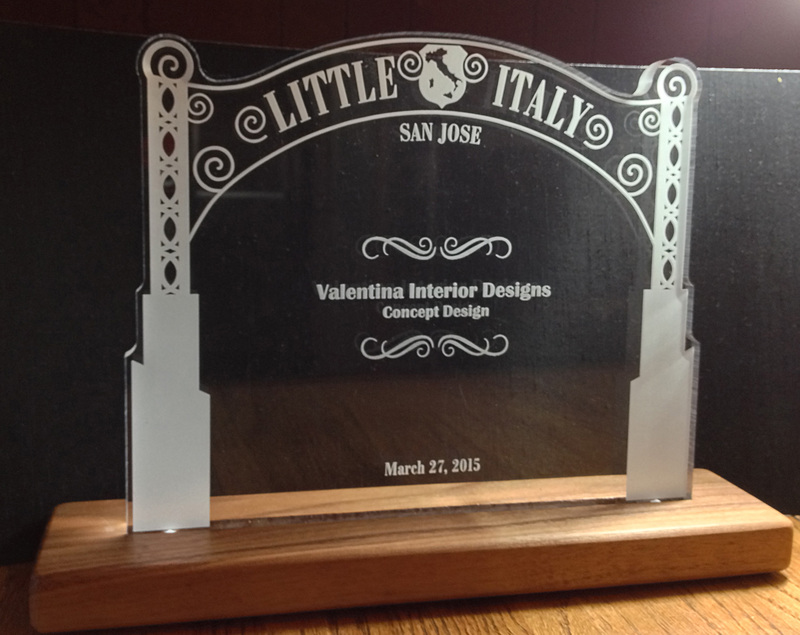 On March 27, 2015 I was awarded a nice plaque for my participation in the design concept of the Little Italy Arch in San Jose, CA. 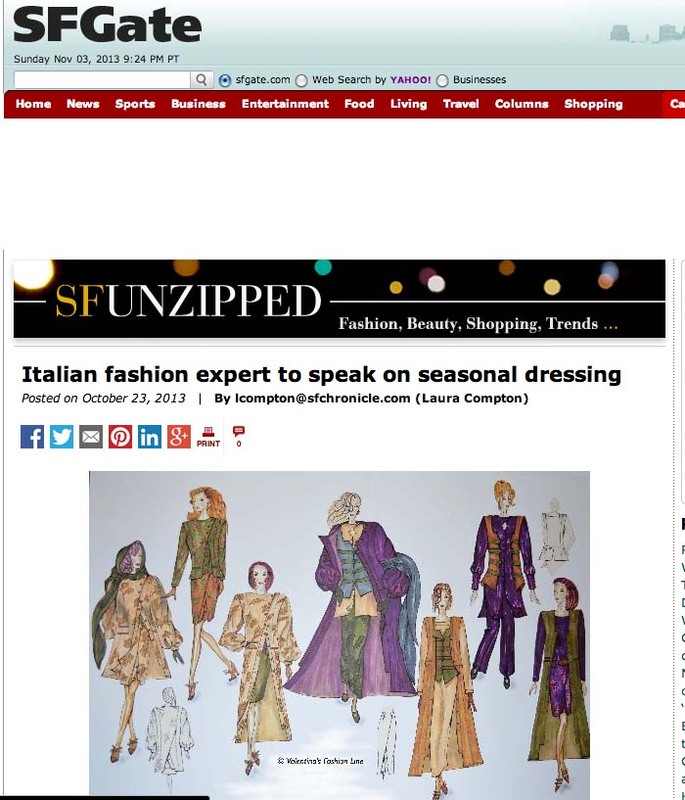 Read here the article La Scintilla Italian wrote on the event. LIFE IS TOO SHORT, EAT DESSERTS FIRST! I am happy to announce that my second book: “Sins Of A Queen” – Italian Appetizers and Desserts was published Dec.14, 2010 as planned. I will be starting the launch the month of January 2011. This second book is marking Valentina’s book collection now in the making. I have plans of writing books on various subjects for the next few years. The third book already in the writing will be on the subject of Colors and will be released by the end of 2011. ©Sins Of A Queen, will show the readers that it is not necessary to be a chef to cook good food, but it’s simply enough to eat those “make you feel good food” to feel like a Queen, the type food that will give so much energy to illuminate an entire city. The Queen (me) will uncover how to prepare desserts with fruit in a healthy way and how to turn appetizers into meal size dishes to keep the readers young and fit, while eating well. Cooking is my passion. I have accumulated a high knowledge of food and a few decades of experience in cooking for family, friends and myself. 1. The recipes are fast and easy for busy working people and delicious. 2. The recipes are healthy. We want to stay young as long as possible. The book is again a promise of youth! 3. Readers don’t have to go to Paris to find the ingredients, they are in local stores. 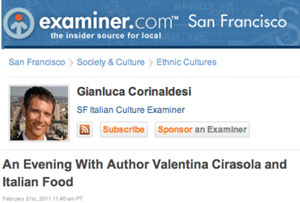 Read article written by Ann Hart on the Examiner.com San Francisco – March 15, 2010. Join Valentina for an afternoon of Puglia cooking, tasty, healthy, and easy for anyone to make. Learn to cook a 5 course meal to show off at any occasion. Valentina will uncover the secret of her people’s longevity and some interesting history about Puglia, its customs, its food and table presentation. 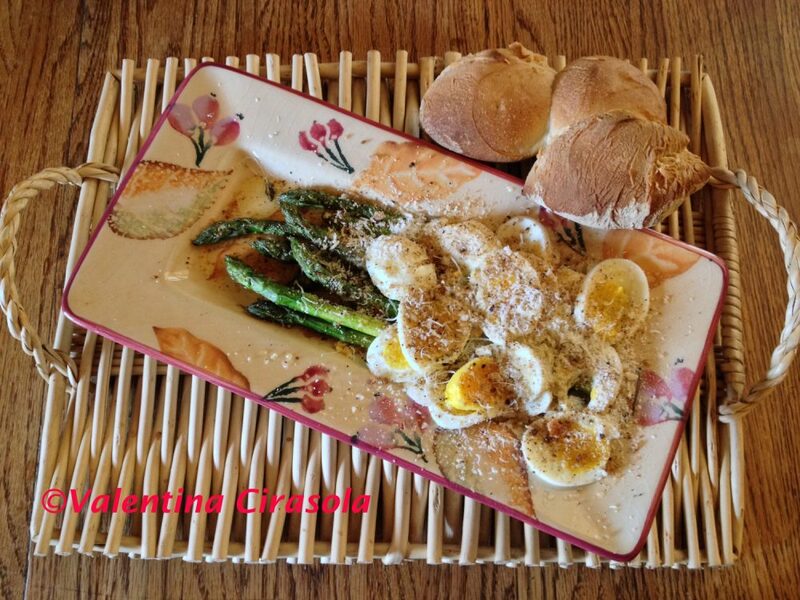 Valentina is a published author of her cookbook on Puglia cuisine: Come Mia Nonna – A Return To Simplicity. Caviale del Poverello (caviar of the poor man – based on eggplant). Cavatelli Mare e Monti (pasta with beans and seafood). Salsicce e Funghi (sausage and mushrooms). Rapini Stufati (stewed broccoli rabe). Dolce- Macedonia di Frutta (fruit cocktail). Register for this class online. Writing the first book was a load of “healthy” fun, so much so that my goal for the next few years is to write a collection of Valentina’s books on various subjects. The titles of all the books I have in mind to write are already there and that is a good starting point. The next book on Italian Appetizers and Desserts will be published by the end of 2010. 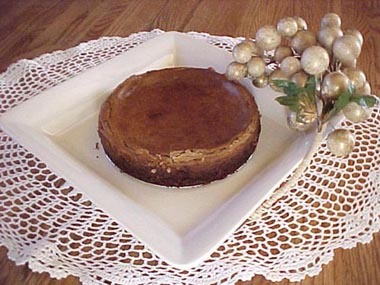 My first book title is: ©Come Mia Nonna – A Return To Simplicity – was published on Thanksgiving day 2009.
a. The recipes I have chosen to include are fast to make and they are delicious. A busy working person can make a nice meal in an hour or less. b. The recipes are healthy, we want to stay young as long as possible. They will help anyone staying on an excellent low calories diet. c. The recipes will save you money in your daily cooking and when you have large parties, the ingredients are not expensive to buy, therefore the book is cost conscious. d. The recipes will impress anyone’s guests. They might ask if the host has gone to the culinary academy to take lessons. e. The easy recipes will help people who have never cooked creating a tasty meal; will help people who are afraid of cooking and those who are very busy. My book ©Come Mia Nonna – A Return To Simplicity talks about the culture of the Italian Region of Puglia where I come from and its healthy cooking. It is a hymn to my Italian land, to my origins, to the stories of the past, anecdotes and traditions. The book is filled with my personal drawings of the various specialties and plenty of photos. This book is a promise of youth! The people from Puglia, in Italy are long-lived, just because of our simple cooking. Be careful not to confuse simple with poor. Simplicity is the key of elegance and when life is simple God answers. Decorating your table and your dining room, using your best ceramic dish and best cutlery for every day use, will bring you the enjoyment of small moments and will enhance your everyday life. While writing this book, I was still doing what I like to do the best: Designing! In fact, I designed the entire book interior and the colorful cover. Once a designer, a person is always a designer! a. Building personal fashion images for my clients based on their body shape, the color of skin, eyes, hair, and personality. b. Building personalized spaces with style in homes and offices based on the client’s lifestyle and making sure the client’s natural energy flows positively and harmoniously. c. Building functional kitchens with all the comforts and modern amenities. There is no better designer than the one who cooks! If I can balance beauty, harmony, comfort, color and style in people’s home, I can also balance aromas, taste, flavors, calories and costs for the dining table as well. Enjoy my book! Ciao. “The red on the cheeks comes from the mouth” ~ an old folk saying. What a marvelous collection of articles, Valentina. And to be featured in the San Francisco Gate! I was “California dreaming” for nearly 20 years (before the cost of housing made me give up), and followed that newspaper for a long time. Aquileana, you are a doll, thank you so much for nominating me with the award, I feel honored. However, since I have received so many awards through the years and I don’t have any more space for them, I have stopped accepting awards. I would like other bloggers to receive all they can. Thanks again for considering my blog.